Have you had time to check out the new email features in Microsoft Dynamics GP 2010? There are third party vendors that have written applications in previous versions of Microsoft Dynamics GP (formerly known as Great Plains) that include this function, which is now included. In prior versions of GP you needed to purchase Adobe Acrobat Writer to attach a PDF document to an email in GP using the “Send To” window. If you wanted to email multiple invoices or purchase orders from within GP, you had to buy a third party product. In GP 2010, you don’t need to purchase anything extra and you can email multiple documents such as PDF files or as HTML, XPS and DOCX attachments. With the new email feature in GP 2010, you can quickly and easily email single documents, batches of documents, and/or multiple documents from a list within the system. The user can email just about every Sales and Purchasing document type available, and also select which customers/vendors should receive their documents in email. You can also create predefined messages for customers and vendors that are assigned at the document level, or create specific messages for customers or vendors. These messages can be changed on the fly in Sales and Purchasing data entry windows. Streamline your processes and free up more time to focus on the really IMPORTANT aspects of your business. 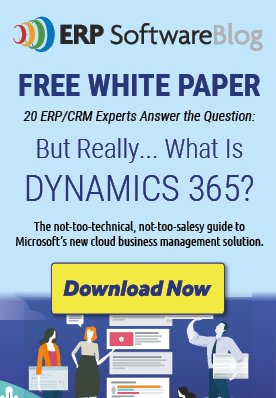 This new feature is definitely a welcome addition to Microsoft Dynamics GP! How to Budget the Cost of ERP Software Implementation Services. And if you’re looking for specific Microsoft Dynamics GP or CRM information, there are more resources on the Sherwood Systems website. If you’re located in the Arizona or New Mexico area, contact Sherwood Systems for assistance in determining if an ERP or CRM software upgrade can help your organization better serve your customers’ needs. (877) 943-9696. Is there a document to show how to setup correctly. I’ve been trying to email myself but not receiving emails. Great post! I think this idea is brilliant. With predefined messages able to be assigned at a document level or at an individual customer/vendor level it means you can really use the feature to grow and manage your business saving time for other important task, particulary with the predefined messages aspect.